I have plunged into a new documentary called "Ice Eagles: An Account of American Aviation in Antarctica." It is obviously not a book; however, it will make extensive use of many historical books on the subject as well as many personal interviews. I have been working on this film since early 2014, collecting research material and interviewing 21 people in Norfolk, VA and Pensacola, FL. I am planning at least five more trips and at least 40 more interviews. I hope to release the film in the Spring of 2016. For those not familiar with Kickstarter, it is a crowd-funding website that gives creative people an opportunity to seek community support for their projects. The person submitting a project gets a project page on the website which describes what they are creating, lists rewards for those who contribute, and provides other information on the project. A funding goal is set and the time period for supporters to pledge funds is also set, in my case 45 days. At the end of 45 days, if the funding goal is met, I will receive all of the monies pledged including anything pledged beyond the goal. If the goal is not met, I get zero. In other words, ALL OR NOTHING. Kickstarter requires that pledges be made online by credit card so that the pledge can be held pending the outcome and cancelled if the goal is not reached. I know that some people are not comfortable using a credit card online. In this case, you could just give funds to a friend who is willing to pledge and have them do it on your behalf. Be sure to let me know if this is the case so that I can credit you properly. By the way, there are a number of rewards for pledging which you can see on the project page. This is the fifth Antarctica-related film that I have made (you can see excerpts from the others at www.gwillow.com) and I am committed to making it as complete and truthful as I can. I will appreciate your consideration. If nothing else, take a look at the Kickstarter page and see what this is all about. 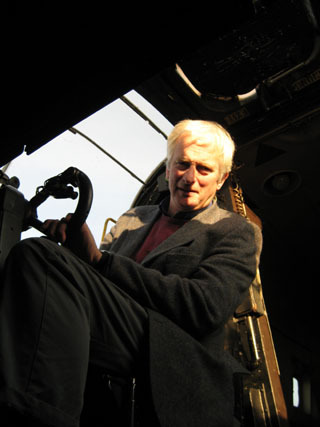 By definition, an aircraft is a "machine that can be flown in the air." Airships and balloons are classified as 'Lighter Than Air Craft', while airplanes, helicopters, autogyros and gliders are 'Heavier Than Air Craft'. Therefore, the first aircraft of any sort to be flown in the Antarctic were the captive balloons used by the [British] National Antarctic Expedition of 1901-1904, and the German South Polar Expedition of 1901-1903. The Australian Antarctic Expedition of 1912-1914 was the first to start out with an airplane, by taking a Vickers-built R.E.P. monoplane with it. Unfortunately this aircraft's wings were damaged beyond repair in a practice flight before leaving Australia, and the Vickers monoplane never flew in the Antarctic. However, it did become the first airplane (or a major part of one) to reach Antarctica. First of two balloons taken south in 1901 on the Discovery. Made first ascent on February 4, 1902, carrying Robert Falcon Scott. This was the first flight in Antarctica by any type of aircraft. A second ascent was then made the same day, carrying Ernest Shackleton. Location was a small bay in the Ross Ice Barrier, near the future location of the Bay of Whales. Second of two balloons taken south in 1901 on the Discovery. Apparently this balloon was not flown in the Antarctic. Balloon taken south in 1901 on the German vessel Gauss. Made ascent on Saturday, March 29, 1902, carrying Erich Dagobert von Drygalski, the leader of the Gauss expedition. A second ascent was made later the same day, carrying Captain Hans Ruser, who was the captain of the Gauss, and Dr. Emil Philippi, the chemist and geologist of the expedition. 1 R.E.P. 60 HP five-cylinder air-cooled semi-radial engine The very first airplane to be built by Vickers, this was a license-built French machine, designed by Robert Esnault-Pelterie. The fuselage was built in France while the wings were made in England. After being tested at Vickers' new airfield at Joyce Green, Dartford, and then at Brooklands, it was crated and shipped to Australia for use by the Australasian Antarctic Expedition. However, the wings were damaged beyond repair on October 5, 1911, during a practice flight at Cheltenham Racecourse, Adelaide, Australia, before the expedition left for the Antarctic. Minus its wings, the machine was converted into an air-tractor, and taken south, but it did not fly in the Antarctic. The first tests of the machine as an air-tractor were made on November 15, 1912. After a short trial trip on November 20, 1912, the vehicle made a successful depot-laying trip with a load of 700 pounds on December 2, 1912. At 3 PM on December 3rd, three men and the air-tractor left the expedition's base at Commonwealth Bay on a major trip. On December 4, 1912, while towing four sledges loaded with fuel and supplies, several of the pistons seized and the engine broke down. The air-tractor was left at this point, about ten miles from the base. Later another party of men recovered the air-tractor, which was taken back to Commonwealth Bay and abandoned there. Volume One, page 24; Volume Two, pages 6-11, 37. The Voyage of the 'Discovery,' by Captain Robert F. Scott, R.N. 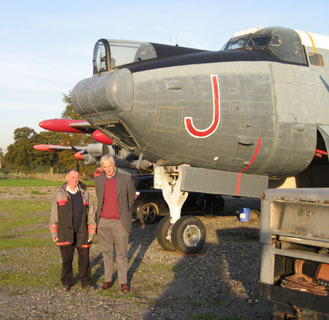 Earlier this year, Jonathan Shackleton and I were flying from Dublin to Gatwick and decided to drop in at the Gatwick Aviation Museum which is in Charlwood, right on the edge of the airport. This is quite an establishment, created and maintained by Peter Vallance, an extraordinary man.